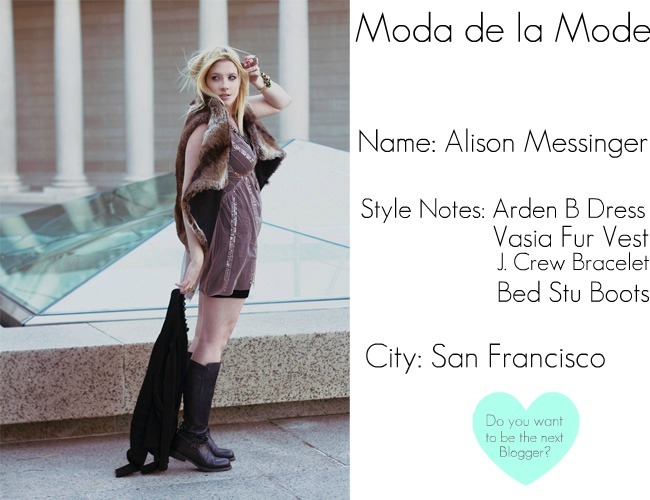 Alsion Messinger is the blogger behind one of San Francisco's most popular blogs. Eclectic Á La Mode. The simply presented content published on her blog in addition to her interesting and engaging tweets on Twitter caught my eye and I knew that she would be a perfect candidate for Moda de la Mode's Blogger Style Feature. Alison's beautifully coordinated outfits and outfit posts on her blog have gained her a huge fan base spanning a range of continents proving that her blog is definitely a must read.